England won by 241 runs. So it seems that all the problems are South Africa's before the second Test begins. They don't have much time to sort them, we get under way again on 2 January. Can England maintain the momentum and take a 2-0 lead? Join us then to find out. The Press Association are reporting that James Anderson is on track to play in the second Test. Anderson bowled around six overs before play began this morning. More from Jonny Bairstow: "There's been plenty spoken about yesterday. It was disappointing to have missed that stumping opportunity but you take it on the chin and move on. Everyone makes mistakes and you have to hold your hands up but another chance always comes along and I managed to get that stumping today which was really pleasing." England wicketkeeper Jonny Bairstow on Sky Sports: "It's very pleasing to start the tour so well. We haven't always started well so it's good to get a win and good to wrap it up so early. "We applied ourselves so well on the first innings and that gave us confidence for the rest of the match. I was happy with the way I was striking the ball, it comes on to you a bit more here than in the UAE, which suits my game." More from Russell Domingo: "It's unlikely that Dale Steyn will play the next match. Not having him is a big blow. "Two players have been added to the squad. Chris Morris is a good bowler and Quinton de Kock is a major talent. "It still needs to be clear about who will keep, but we're hoping that Quinton will take the gloves from AB." South Africa coach Russell Domingo on Sky Sports: "It's very disappointing. A lot of questions need to be answered and we've got some thinking to do in the next couple of days. "We're not getting enough runs. There's some quality batting in our line-up, but they are down on confidence. "Confidence is what it's all about. It's not a bad thing that it's a two-day turnaround. We just have to get on with it and improve. "I was expecting a lot more fight and I'm disappointed with how we have gone about it. "I didn't think our bowling was bad at all. England bowled well, they put us under pressure from ball one." "I thought it would be close this series. South Africa look as if they're past their best with injuries not helping. They dropped three catches in no time when they were under pressure. They've got real problems." "I don't know if the technique of the South Africa batsmen is good enough to stay in against good bowling. "I could go through them and it doesn't look too good. You always need a good defence in Test cricket. You can't play shots if you can't stay in. "All club players will tell you the same. There's no point playing two of three good shots then getting out." Email Message: Stewart McArdle: Congratulations to England, the better team. However, how can any player, other than Elgar, who carried his bat and was the only player to get to three figures, get this man-of-the-match award? By the way, I'm from Yorkshire.....!! Stewart McArdle: Congratulations to England, the better team. However, how can any player, other than Elgar, who carried his bat and was the only player to get to three figures, get this man-of-the-match award? By the way, I'm from Yorkshire.....!! "It's about two things: having a good defence and being selective in the shots you play. That's why AB De Villiers is a class apart. "The others have been psychologically damaged by the Indian series and now they're not sure how to play." Man of the match Moeen Ali: "It's been good, it's nice to have a good start here. "I'm not really worried about batting higher. i feel at number eight I change the momentum. It's a nice role to be able to change the game with bat and ball. "I think of myself as being attacking, but sometimes I have to hold an end." "I thought England played very well. It was an excellent performance. The pitch didn't do too much, there was nothing alarming. "Nick Compton solidified the middle order with James Taylor. If you can't bat, you don't win Test matches. By staying in the game, getting to 300, Taylor and Compton adapting, that was the beginning for England." More from England captain Alastair Cook: "It's our first away win for a long time so we will enjoy this but we know what a strong side South Africa are at home. "It's great to see so many English fans here supporting us. The Barmy Army were a little bit quiet over the five days so their challenge is to make a bit more noise at Cape Town." England captain Alastair Cook: "The lads played really well. It was tough to bat but the way Nick Compton played after being out of Test cricket for a while, he was a rock int he first innings to give us a platform, and then we bowled well in both innings. "The bowlers mixed their pace and were relentless. It's pretty easy to captain because you know they will deliver. We didn't quite get the results in Abu Dhabi so it's good to get this result." How bizarre. As Hashim Amla was speaking, South Africa tweeted that they have added two players to their squad for the second Test. Chris Morris covers Dale Steyn, while keeper Quinton de Kock's call-up suggests a reshuffle. "I think Amla will captain the side at Newlands but I wouldn't be surprised if it's someone else for the third and fourth Tests." More from Hashim Amla: "It's more about confidence. Once you get runs, you play differently. The only way you can do that is get the runs. We have to patient with the younger guys. "Dale Steyn is injured, so I think there will be a replacement. I'll leave the rest to the selectors. "England are a good team. The series will be a contest and hopefully we can make it tougher for them." South Africa captain Hashim Amla: "Dean Elgar played superbly. It was great to see him at his best. I'm really happy for him. "I can't fault the bowlers. They were exceptional in India and here. They have kept the team in a good space in that regard. We just need to get the runs on the board. "The wicket played better than we thought it would, but we would have taken them to be 40-3. Our first innings batting let us down. We couldn't put the pressure on them." "Jimmy Anderson will be desperate to get back in, so he's not forgotten, so people don't start saying Stuart Broad's better when he leads the attack." Charles Coldman: ‏Clinical. Ruthless. Not words you often associate with an England Test performance overseas. SA were woeful mind. Caroline: Well done England! A wonderful win! Moeen Ali has emerged from the dressing room, so it looks like he will be named man of the match. "South Africa could improve their team immensely in one swift stroke by stopping Amla having to have the captaincy and AB de Villiers keeping wicket. They're roughening up two of their diamonds." VillanUK: ‏They think its all over, it is now. Well done Eng, fantastic performance. THE MIGHTY ARSENAL: And done!! Broad tidies up Morkel. England win by 241. Fantastic performance by the boys. On to Cape Town 1 nil up. "That wicket in the first over just killed South Africa off. I can't believe it's actually got this close to lunch after that. They just fell like dominoes afterwards." South Africa's last seven wickets fell for 38 runs - in the middle of that they lost 5-7. Without question the biggest one of the lot was AB de Villiers, lbw to Moeen Ali in the first over of the day. After that, it was a matter of time. England take the applause of the Barmy Army - this is a very significant win at the beginning of an overseas series. Remember, England had won only one of their previous 15 overseas Tests. The tourists have James Anderson waiting in the wings, while South Africa have a host of problems. "England have outplayed South Africa hands down in this Test match." All over! Stuart Broad has the final wicket, Morne Morkel is not saved by the replay. 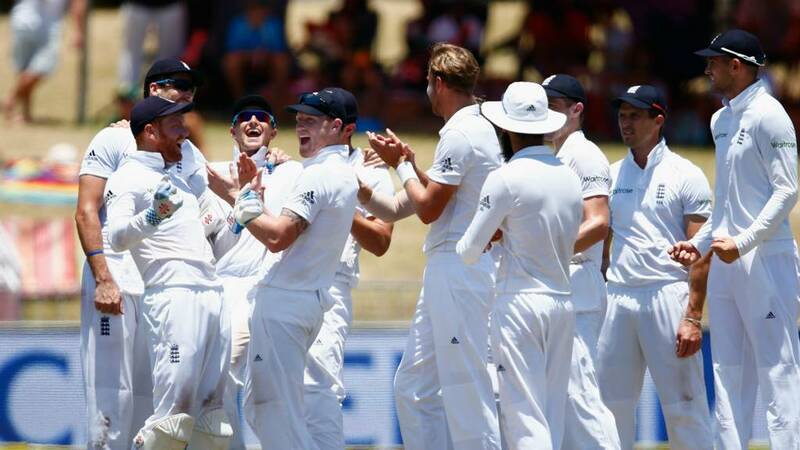 England's celebrations begin - they have thumped the world number ones by 241 runs. "This looks absolutely plumb to me." Moeen Ali off, Stuart Broad on. New problems for Morne Morkel. "Sometimes you have to think of the bigger picture and I think that's what Alastair Cook was doing. Chris Woakes might be needed for the next game if Jimmy Anderson's not 100 percent. Getting him on and getting a couple of wickets could do him the world of good." All is still at Kingsmead. Sunshine, blue sky, only birdsong as Woakes slips in to Duminy. Outside off stump, Duminy happy to leave alone. You can feel a bowling change on the horizon. Email Message: I’d give man of the match to Nick Compton for his first innings 85. Returning to the side with something to prove after being unfairly discarded to steady the England ship after the early wickets of Cook and Hales. Without him and his partnership with Taylor we wouldn’t be where we are now. How often have we collapsed recently. I’d give man of the match to Nick Compton for his first innings 85. Returning to the side with something to prove after being unfairly discarded to steady the England ship after the early wickets of Cook and Hales. Without him and his partnership with Taylor we wouldn’t be where we are now. How often have we collapsed recently. John, what is a sprung clavicle? It sounds painful. Morne Morkel should take it easy on Moeen Ali here. Many more of those boundaries and he might have to face some pace instead. All a little curious at the moment - like we're waiting for the inevitable. Email Message: Thank you England for cheering me up on my journey to have my 'sprung clavicle' popped back in! Five wickets during the short drive to the hospital! Just one more before I go in to see the doctor please??? Thank you England for cheering me up on my journey to have my 'sprung clavicle' popped back in! Five wickets during the short drive to the hospital! Just one more before I go in to see the doctor please??? VillanUK: Man of the match is going to be tricky, even Jonny's quick fire 76 yesterday turned the match. Moeen continues to Morkel. I wonder why England didn't give big Morne a blast of pace when they knew he would be on strike? Five catchers around the bat, but Morkel getting though, even if England ask an optimistic question for lbw. The Barmies (or one Barmy in particular) are doing their version on The Lion Sleeps Tonight. In the sunshine, Woakes comes round the wicket to Duminy, who is doing his best to farm the strike. He gets through the over, but can't prevent Morkel from facing the music next up. Adam Wheeler: Best I have seen Moeen bowl on a turning pitch with the pressure of expectation on him. He has learnt from his UAE experience. Before that wicket, TV commentators were pushing Graeme Smith on if he is making a comeback or not. He definitely didn't rule it out. You sense there will be quite a post-mortem in South Africa after this match. One wicket to win. Morne Morkel coming out to the crease. England one ball away. With two left-handers at the crease, Moeen Ali is recalled. "It's a beautiful delivery. Woakes has bowled some lovely deliveries with this ball which is 64 overs old. He's done the job, it makes the captain look fantastic." The change does it and England are one away from a 1-0 lead. Dane Piedt looked comfortable against spin, but lasts only six balls against Chris Woakes. Angled in, an inside edge on to the pad, James Taylor does the rest at short leg. South Africa have lost 5-19 this morning, 6-19 overall. Joshwin Maharaj: ‏Please come back Graeme Smith. We need your captaincy and your opening batsmen-ship. Andrew Murphy: Does Graeme Smith fancy a game for SA this series, no way he still wouldn't walk straight into this SA side. A drinks break does bring a change, with Stuart Broad replacing Steven Finn. JP Duminy has obviously decided than Dane Piedt is doing a decent job against Moeen Ali, so turns down the singles on offer. Duminy has problems of his own, mind. One Broad delivery has Duminy groping, not knowing whether to have his breakfast or a haircut. "We all think of Jimmy Anderson and Stuart Broad, but Finn and Moeen Ali get wickets." Email Message: Listening with my son Archie at the bottom of the ski lift in Obergurgl Austria, hurry up England we want to go skiing. Listening with my son Archie at the bottom of the ski lift in Obergurgl Austria, hurry up England we want to go skiing. "I don't fancy Duminy too much, he's struggling. He really needs a big innings here and the tail-enders, they needed AB De Villiers as he would have given them confidence." I'm very much enjoying the insight of the stump mic. Jonny Bairstow decides it's a "matter of time" if Dane Piedt continues to play Moeen Ali in this fashion. Extra catcher on the leg side, Moeen targets the leg stump, but Piedt looks solid. He should have come in at number three. David Lee : Was hoping for the text commentary to keep me company on the slow Sleeper from Chiang Mai to Bangkok... Looking unlikely now! Richard Powell: No complaints with the collapse here. House being viewed at 10am so need to be out by then! England have decided that these batsmen are at the wrong ends. They want Duminy to take a single and expose Piedt to Finn. Still lots of chirp from England, punctuated by an "outstanding" from captain Cook. It doesn't sound quite right from the ex-choirboy. Someone else shouts to "stay strong Finn-dog". A change might be coming. Email Message: Trivia Test Match (re: Martin Coxhead @ 8:21) with Brian Johnston in the chair and Willie Rushton and Tim Rice as regular captains was very funny and is often repeated on Radio4 Extra. Far from Martin's 'Absolutely Dreadful'. It's always a joy to hear Johnners' voice. Trivia Test Match (re: Martin Coxhead @ 8:21) with Brian Johnston in the chair and Willie Rushton and Tim Rice as regular captains was very funny and is often repeated on Radio4 Extra. Far from Martin's 'Absolutely Dreadful'. It's always a joy to hear Johnners' voice. "It's been quite a balanced performance from England. Everyone's chipped in and done what's needed to be done." You really do wonder what difference Graeme Smith would make to this South Africa side. He wouldn't need to do much - even batting 11 and captaining would probably help. Ryder Cup-style. I've just seen shots of Durban beach. The Barmies will be there this afternoon. Kulvinder Kaur Johal: Our team deserve huge praise for making SA look so mediocre. Fantastic batting and bowling with Jimmy yet to come. JP Duminy is surrounded by more fielders than a man handing out free fivers. Has he nicked that from Finn? Big noise, but no appeal from anyone. Replays suggest he hit his pad. Two nice drives bring boundaries, drawing applause from our padded-up friend in the crowd. "There are not a huge amount of options available. Our domestic system is not a strong as it used to be." Are England spoiling your plans to follow the cricket at work today? Are you in danger of having to be productive? Moeen to Piedt in the sunshine, the close fielders almost delirious with excitement. Who is that man in the crowd? He's about 60, dressed in full whites and padded up. Green helmet, green pads, gloves, bat in hand. He's been there for the whole match. He's probably (quite rightly) thinking he could get into this South Africa batting line-up. Remember, South Africa are the world number ones. England are sixth. Matt Taggart: "I'll clean the house once the Cricket is over" may not have been the masterplan I thought it was. Steven Underwood:‏ Slow down England, you're ruining my current plan for getting through a day in a dead office! If you're keeping track, South Africa have now lost 5-7 since last night. Dane Piedt is the latest rabbit out of the hutch, getting through the rest of Moeen's over with far more idea than Abbott had. Moeen Ali has seven wickets in the match. "Disappointing from South Africa. It has been a challenging few days, sometimes it is the way you lose that makes it difficult to come back. They have to find a way to re-group before Newlands." Out. Just out. Kyle Abbott hasn't had much idea against Moeen Ali and he makes a fatal error by playing off the back foot. Pitching on the stumps, straightening, Abbott missing, Moeen on target. England two away, South rolling over to have their bellies tickled. An incorrect answer would be greeted by the voice of Boycott saying "rhubarb" while a correct answer would prompt whatever noise Boycs made when Pietersen baseball-batted Brett Lee down the ground at the Oval in '05. Incorrect respondents would be banished to the Corridor of Uncertainty, where they would be unable to play the next question posed. Finn pumps his arms towards Abbott, who looks like a man trying to remember everything he was taught in the nets. Keep you eye on the ball would have been one tip, one which Abbott forgets when he wears a short ball on the hand. Si Lomas: ‏How does Rilee Rossouw not get in this aberration of a South African batting line-up, always looked a tidy player I've thought. Dave Hansford: ‏England bowling well but SA fans surely have questions about motivation and application here. South Africa are looking at a fourth defeat in five Tests. No win in seven. It's usually the England captain who goes when these two sides meet, but could Hashim Amla be under the pump? This would equal their worst run since readmittance. "Lovely, Moeen Ali," is the chirp from behind the stumps as the offie examines Duminy. Richard Mayo: My son wants me to play lego but I'm too busy watching internet text commentary on #bbccricket. Maybe in 10 mins when South Africa are beaten. RunMattRun: Village, South Africa, village. Villan UK: It is amazing that a game played over 5 days can be lost or won within 5 minutes, well done Moeen. That's four wickets for Steven Finn, one more and he bags a Michelle Pfeiffer. Kyle Abbott, who looked poor in the first innings, is the new man, facing Finn as the Barmies clap him to the crease. That's another trimmer, beating the outside edge. South Africa's collapse is now at 4-2. "Steyn just playing down the wrong line and the off-stump cartwheeling out of the ground. Well done Steven Finn, removed Steyn, no apologies for the pun. We'll be home in time for tea and crumpets at this rate." Bowled him! That's an absolute rozzer from Steven Finn, taking the off stump of Dale Steyn, a full pint out of the ground. Angled in, pitching off, straightening to take the top of the same peg. That's a good nut to any batsman, but far too good for a tailender posing as a nightwatchman. We're speeding towards the end here. Email Message: There once was a cricket quiz on BBC Radio year ago, called something like Test Match Quiz, where the likes of Tim Rice and William Rushton answered questions worth one, four or six runs and if they got it wrong and the other side got it right it was a wicket. Brian Johnson was the chairman. . It has been repeated on Radio4Extra within the last year or so. Absolutely dreadful. There once was a cricket quiz on BBC Radio year ago, called something like Test Match Quiz, where the likes of Tim Rice and William Rushton answered questions worth one, four or six runs and if they got it wrong and the other side got it right it was a wicket. Brian Johnson was the chairman. . It has been repeated on Radio4Extra within the last year or so. Absolutely dreadful. Every ball feels like an event here. A little grenade of English danger that could push South Africa closer to defeat. Dale Steyn, who seems to have a pillow under his shirt as a chest guard, shows the self-control to not smash Moeen Ali into the sea. Restraint. For now. As Dale Steyn plays his lone resistance to Steven Finn, the figures in the South Africa dressing room sit statuesque, not talking to each other. It's like a funeral in there. Single to Steyn, then Duminy has to have gloves and inners off for an adjustment. "Up and down," squeaks Joe Root from second slip. Theo Bowyer: ‏Set alarm for 7:45am... Snooze, snooze, snooze and you lose. Missed 2 wickets! Colin Curryer: ‏South Africa have started like they really want to get a move on and finish this match. Robert Stow: ‏The last Test match stumping by an English wicketkeeper was, er, just now. Well done Mo and Jonny! Going back to last night, South Africa have lost three wickets for no runs. The new man is JP Duminy - a batsman currently unsure which end of the willow to hold. A replay of the Bavuma wicket does him no favours - he was barely in the shot when the bails came off having played down the Bakerloo line. Just awful. "Just as the first wicket was big for Moeen, this is even bigger for Jonny Bairstow. It beat the bat on the outside edge but Bairstow didn't panic. That will banish his demons from yesterday." Temba Bavuma, what on earth are you doing? That is cricketing suicide. His sixth ball, Bavuma skips down to Moeen Ali. The ball goes straight on and Bavuma is past it. Jonny Bairstow, who made the mistake of missing AB de Villiers last night, doesn't fail this time. Bails off in a flash. In the South Africa dressing room, an unidentified figure covers their face with their hands. That's a pretty good reaction - it was that bad. Adam Davies:That's absolutely massive from Moeen. Got his reward after last night. That was the one man who could save SA! Nerves cleared! Rachel T: Whoah!!!! Game over?! Stuart Mitchell: ‏Get in Moeen you beauty, last 5 should be a procession. A penny for Dale Steyn's thoughts. Bad shoulder, out there to be nightwatchman, resisting the urge to whack it out of the park, the senior partner in De Villiiers already gone. He faces up to Steven Finn with a phalanx of slips and a short leg in place. Shuffling around, jamming down, Steyn somehow survives. "The wicket is massive for Moeen because he will have gone to bed last night very nervous that people expect him to win the game." "De Villiers is the one guy who has the potential to bat all day and frustrate England. There was some talk in the South African commentary box that England might be nervous that South Africa could win the game. I don't think that will continue now." Temba Bavuma is the new man, immediately facing an appeal from the fielders that Moeen himself turns down. At the end of the over, Moeen gets huge applause from the Barmies gathered on the grass bank. Looking again at the wicket, the ball disturbed the surface as it pitched. As England watched the replay on the big screen, they were cockahoop when they saw the ball-tracker confirm Aleem Dar's decision. "What a huge start to the day for England and Moeen Ali!" A huge, huge moment only three balls into the final day. England could well have sealed the match right there. It definitely kept low from Moeen Ali, pitching on the stumps and straightening. AB de Villiers' back-foot defence was done by the lack of bounce. The replay shows it would have clipped the leg stump. What. A. Start. "This could be the Test match basically in the first over." It's beautiful again in Durban - the rain won't be coming to save South Africa any time soon. Cloudless sky and perfect sunshine. AB de Villiers and nightwatchman Dale Steyn emerge into a pretty empty stadium. Moeen Ali is at the end of his run. "It will help the rest of the players if De Villiers is still in. They see him playing the ball easily and it does lift the tail. If he goes, I wouldn't expect them to last too long." Arleth Eaton: What's this new concept of test matches? Taking 5 days to play and all 3 results still possible? This should happen more often. "Finn gets wickets, you don't want to be interfering with his action. I think he's a terrific bowler." Test Match Special has hit the airwaves from Durban - Aggers and co will be on their marks for a quick dash to Cape Town for the second Test on 2 January. You can listen by hitting the live coverage tab at the top of this page, on digital radios and TVs or via various BBC apps. More from England assistant coach Paul Farbrace on Sky Sports, on Bairstow's missed stumping of De Villiers: "You get a split second to see that. He’s looked very comfortable with the bat in both innings and he has kept very well, he’s working very hard to get his keeping right. You make one mistake and the focus is on that." Or maybe Stephen Fry would be in the chair, with Andrew Samson as the Richard Osman character? Samson's Corner, or something like that? So, what make you of all this? England set for victory, or South Africa to pull out characteristic resistance? De Villiers to hang around, or England to make short work of the Proteas? Text 81111, tweet using the hashtag #bbccricket or email tms@bbc.co.uk. Also, on the subject of game shows, why has no one ever tried a cricket-themed quiz? Surely you could put Boycott Bingo on prime time telly? England assistant coach Paul Farbrace on Sky Sports: "We are very confident but De Villiers is still there and all the time he’s there they will think they have a chance as well, that’s the beauty of Test cricket." Cook's England need only six wickets to defeat world number ones South Africa in the first Test in Durban. Set a fanciful 416 for victory, the Proteas have slipped to 136-4. Steven Finn has three wickets, Ben Stokes one. AB de Villiers, reprieved of being stumped by Jonny Bairstow, remains on 37 and seems to be the only obstacle between England and glory. Yep, if Alastair Cook was on karaoke, he might sing the classic Lisa Stansfield line "been around the world, but I can't find my (win) baby". Today, though, Cook might just be set for the winner's song. There was a welcome drawn Test in India (a good result, sealed series victory), a stalemate in New Zealand, a horror show in Australia, a lone win in the West Indies and a battling defeat by Pakistan in the UAE. Three years. 15 Tests. One win. Fifteen to One isn't just the rebooted Channel 4 quiz hosted by Sandi Toksvig, it could also be the name of the best-selling DVD 'England's Overseas Test Troubles 2012-2015'. That might be hosted by Sandi Toksvig too.